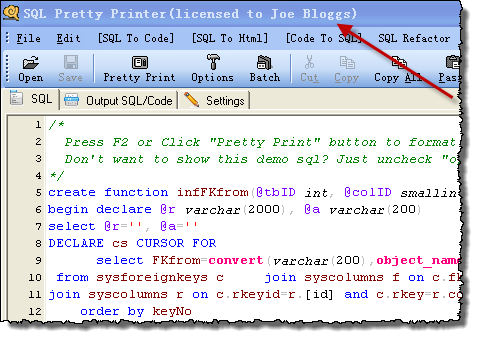 A while back I did a day of consulting for James Wang on his SQL Pretty Printer software. One of my many recommendations was that he displayed the name of the licensed user prominently in the software, to discourage casual license key sharing. He recently reported back to me that he had made this change and it had significantly increased the number of orders for multiple licenses. The average number of licenses per sale increased from 1.34 to 2.65 since he made the change in February 2011. That is a 98% increase in sales! And it only took a week to change the licensing system. Each time I have had an increase in sales, I found that it was mostly due to marketing related issues like changing the licensing system or paying for a link from a site which has a highly targeted audience for my software, not due to a new version release. Of course it helps that James had a good product in the first place. This entry was posted in consulting, marketing, microISV, software and tagged licence, licencing, license, licensing, name, software on 26 June 2011 by Andy Brice. Should I give free upgrades for life? Subscription payments and purchase + maintenance are nice, if you can get them. They give a more predictable cash flow for a business and you can generally charge a higher lifetime price than you can with a single payment. But this isn’t appropriate for all types of software. For example, it doesn’t make much sense for lower priced desktop software. Assuming subscription or purchase+maintenance isn’t an option, the question boils down to – should we charge for major upgrades? Income new licences (blue) vs income from upgrades (red). Click to enlarge. Percentage of annual income from upgrades. Click to enlarge. 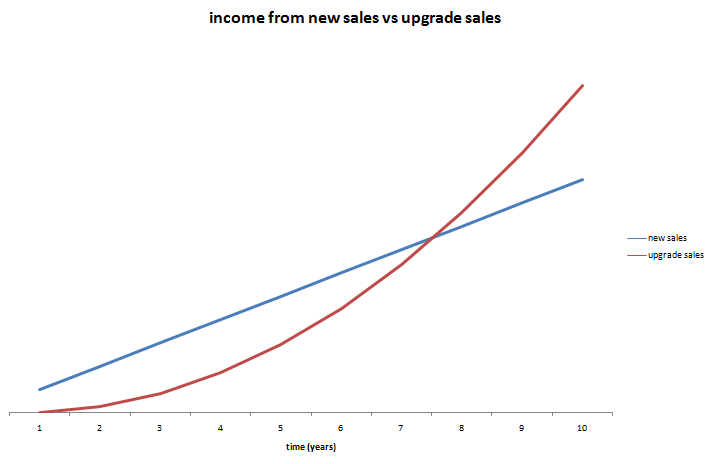 In year 8 the upgrade income is actually worth more the new licence income. 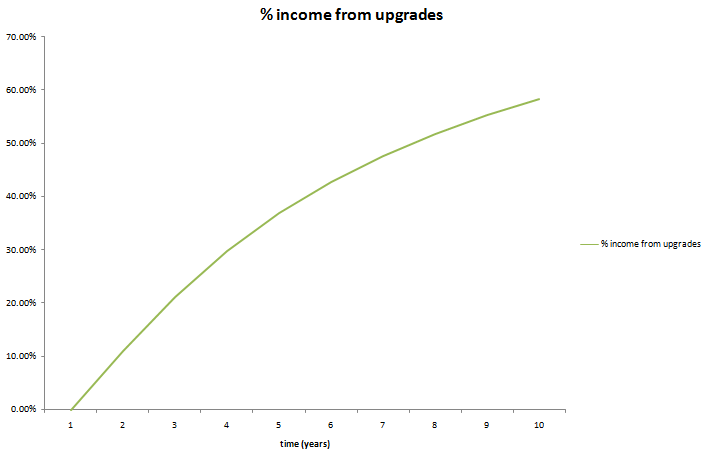 By year 10 upgrades are worth some 60% of yearly income for the product. If the product has a 10 year lifespan, nearly 50% of the total income from the product will be from upgrades. So it only makes commercial sense to give free upgrades for life if this will at least double the conversion ratio. This seems highly unlikely. You can always try changing your upgrade policy and measure what effect it has on your conversion rate. Not much, I would guess (if anyone has tried it, I would be interested to know the results). Even in a more pessimistic model where only 30% of customers upgrade and they only pay 30% of the new licence fee, upgrades still account for nearly 25% of total income over 10 years. You can download the spreadsheet and play with the parameters yourself. A product has a long life span. Customers are very likely to upgrade to a new version. There is little growth in new sales. In the worst case you could end up with a product with a huge customer base built up over a long period, but which makes very few new sales as it has saturated the market. Free major upgrades would mean that each major release is then going to result in large expense (developent and support) but very little income. Microsoft must be very happy they didn’t offer free upgrades for life on Windows or Office! The fact that the customer is expected to pay for major upgrades needs to be made clear before purchase. Any major bugs in version n should be fixed before releasing version n+1. A major upgrade should have significant new features. Major upgrades should not be released more than once every 12 months. The upgrade fee should be reasonable. Around 40% of the cost of a new licence seems typical. There should be a grace period for free upgrades. E.g. If I buy v1 of a product on 01-Jan I don’t expect to have to pay an upgrade fee for v2 released on 02-Jan. Typically this grace period is 3-6 months. If you are offering free upgrades for life currently, you can change your policy to paid major upgrades. But, obviously, you will need to honour free upgrades for everyone who purchases before the change of policy. There are some, apparently successful, companies that offer free upgrades for life (Axialis for example). But I have heard many tales of small software vendors regretting their initial decision to give free upgrades for life. The easiest customer to sell to is the one you already have. If you don’t charge for major upgrades, are you leaving large amounts of money on the table? This entry was posted in article, marketing, software and tagged free, licence, license, licensing, lifetime, model, paid, upgrades on 8 September 2008 by Andy Brice.